"Our method is similar to the technique used to provide the computing capabilities of computers," says Linyou Cao, an assistant professor of materials science and engineering at NC State and corresponding author of a paper on the work. "In computers, an electric field is used to turn electric current on or off, which corresponds to logic 1 and logic 0, the basis of binary code. With this new discovery, a light may be controlled to be strong or weak, spread or focused, pointing one direction or others by an electric field. We think that, just as computers have changed our way of thinking, this new technique will likely change our way of watching. For instance, it may shape a light into arbitrary patterns, which may find applications in goggle-free virtual reality lenses and projectors, the animation movie industry or camouflage." Controlling light with electric fields is difficult. Photons, the basic units of light, are neutral – they have no charge, so they usually do not respond to electric fields. Instead, light may be controlled by tuning the refractive index of materials. Refractive index refers to the way materials reflect, transmit, scatter and absorb light. The more one can control a material's refractive index, the more control you have over the light that interacts with that material. "Unfortunately, it is very difficult to tune refractive index with electric fields," Cao says. "Previous techniques could only change the index for visible light by between 0.1 and 1 percent at the maximum." Cao and his collaborators have developed a technique that allows them to change the refractive index for visible light in some semiconductor materials by 60 percent – two orders of magnitude better than previous results. 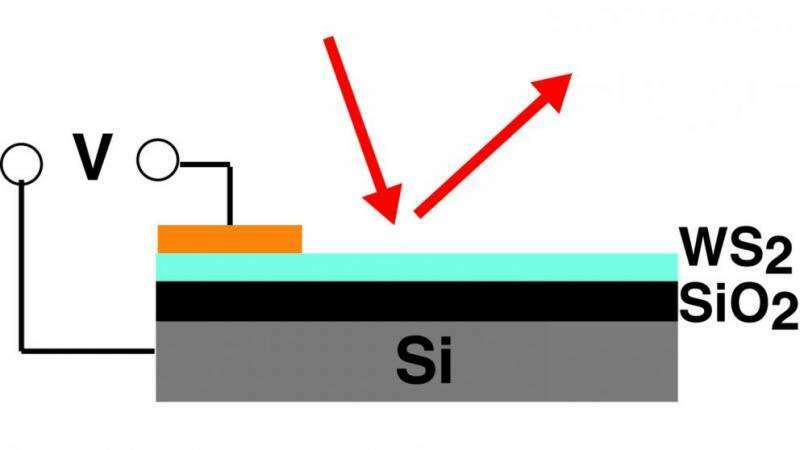 The researchers worked with a class of atomically thin semiconductor materials called transition metal dichalcogenide monolayers. Specifically, they worked with thin films of molybdenum sulfide, tungsten sulfide and tungsten selenide. "We changed the refractive index by applying charge to two-dimensional semiconductor materials in the same way one would apply charge to transistors in a computer chip," Cao says. "Using this technique, we achieved significant, tunable changes in the index within the red range of the visible spectrum." Currently, the new technique allows researchers to tune the refractive index by any amount up to 60 percent – the greater the voltage applied to the material, the greater the degree of change in the index. And, because the researchers are using the same techniques found in existing computational transistor technologies, these changes are dynamic and can be made billions of times per second. "This technique may provide capabilities to control the amplitude and phase of light pixel by pixel in a way as fast as modern computers," says Yiling Yu, a recent graduate of NC State and lead author of the paper. "This is only a first step," Cao says. "We think we can optimize the technique to achieve even larger changes in the refractive index. And we also plan to explore whether this could work at other wavelengths in the visual spectrum." Cao and his team are also looking for industry partners to develop new applications for the discovery.